Fascial unwinding focuses on relieving pain or restrictions in the body’s soft tissue through gentle manipulation. This is achieved by employing the concept that the human body can release its own trauma through the use of proper techniques and guided support. To better understand fascial unwinding, read the questions and answers from Clark Korb, NCTMB, HHP, owner of Rejuvenation Bodywork in San Diego, California. He is certified as a BioSync® practitioner and consultant, and is a holistic health practitioner. Having begun his professional career as an electrical engineer, he transitioned into holistic health and bodywork nearly a decade ago. Fascial unwinding is an approach used in bodywork or manual therapy that enables the release of soft tissue within the human body. This soft tissue, or fascia, is the substance that surrounds and packages all organ, musculoskeletal and connective tissue. What does the word ‘unwinding’ mean? The term ‘unwinding’ describes a nonlinear and more comprehensive mechanism for releasing trauma or restrictions stored within soft tissue as compared to more linear methods such as compression or static traction. Is ‘unwinding’ a singular practice? There are several modalities or healing protocols that are based upon the concept of unwinding. Such protocols include osteopathic manipulative treatment (OMT), craniosacral therapy (CST), myofascial release (MFR), BioSync®, and strain-counterstrain techniques, among others. What is the brief history of fascial unwinding? The origins of unwinding stem back to the late nineteenth century when Andrew Taylor Still, MD, DO, was credited with founding osteopathic medicine. Many innovators have expanded upon this work, including John Upledger, DO, who brought CST to the mainstream outside of osteopathy. Other innovators, such as Mark Lamm who created the BioSync® method, introduced the idea of using the practitioner’s ‘chi’ – life force energy – to assist in the unwinding process. How do you incorporate all of these techniques into your practice? The work in my practice draws from several of these sources, in addition to applying theories from neuromuscular/trigger point therapy as well as Milton Trager’s concept of ‘hook up’ to facilitate change with an effortless quality. How does fascial unwinding work? The process of unwinding involves the transformation of trauma, pain or restriction in soft tissue through a series of gentle, non-invasive manipulations by the practitioner. A key aspect to unwinding is recognizing that the client’s body is essentially responsible for releasing its own trauma via the encouragement and direction of the practitioner. What is the expected result of fascial unwinding? Releasing the trauma makes a client feel safe in the process since he or she co-participates in regulating the magnitude and rate of change that is accomplished during a session. While the concept of unwinding is fairly broad, the nature of the restriction – as well as the particular type of tissue to be unwound – will govern the level of passivity used to facilitate the change in the tissue along with the corresponding pattern that is being subconsciously released by the client’s nervous system. How is fascial unwinding administered? In my practice, I administer the protocol using a blend of the custom postural devices which were designed for use with the BioSync® method, as well as a standard bodywork table and mat. Clients wear comfortable, non-restrictive clothing while receiving the work. Depending on the particular areas in the body that need to be addressed, clients occupy a number of different postures that allow for the best access to the tissue needing to be addressed. What is the difference between passive and active unwinding? When more passive forms of unwinding are needed, the client is comfortably placed in a posture where the practitioner brings awareness and support of the area(s) of the body needing to release restriction or shift structurally. 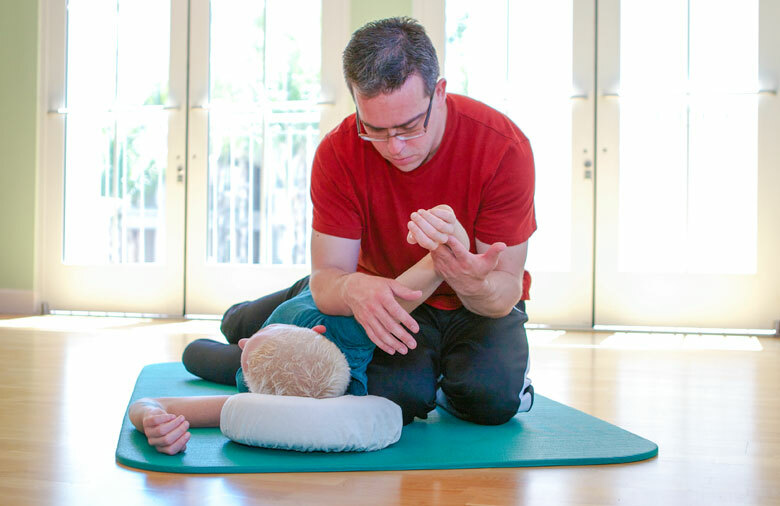 In this way, the body is supported through a series of gentle, non-invasive holds which allow for the soft tissue to release areas of holding with minimal encouragement from the practitioner. When more active unwinding is required, a combination of techniques, including mild compression, traction, passive joint movement, and applied chi-based movement are utilized to initiate or accelerate change within the soft tissue. What are some of the components of fascial unwinding? The first and most essential component of unwinding relates to awareness. Clients typically have some form of conscious awareness relating to experiencing pain, tightness, or a restriction in range of motion when they arrive for a session. Oftentimes, however, the origins of pain or restrictions are not proximal or fully contained within the part of the body that is symptomatic. What determines the effectiveness of the fascial unwinding? The effectiveness of fascial unwinding, or any modality for that matter, is strongly dependent on the ability of the practitioner to identify and address these origins of restriction. Sometimes these are not necessarily apparent based upon the external symptoms presented by the client. Once the awareness of all relevant area(s) of concern is achieved, the practitioner must identify the appropriate level of passivity – or activity – used to unwind the restrictions via a proper combination of the techniques outlined above. What can fascial unwinding help with – what are some popular uses? Fascial unwinding is well suited to handle a variety of soft-tissue challenges ranging from musculoskeletal problems to visceral restrictions. For some individuals, these challenges include repetitive motion injuries or postural distortions that arise from repeated movement patterns or postures over an extended period of time. Such patterns are commonly formed in the workplace when one occupies a particular position or performs repeated movements for many hours in a day and reinforces this pattern over weeks, months and years. For others, the restriction may result from either a physical or emotional trauma which is stored in the tissue based on a singular event. How do people react to the treatments? Once individuals experience a shift or release in their restricted tissue, they frequently have a greater sense of self-awareness and marvel as to how they have lived with such pain or restricted motion for so long. They begin to fold this work into a maintenance plan for dealing with the wear and tear of everyday life. This is similar to how they would incorporate acupuncture treatments, yoga classes, and regular exercise to maintain wellness rather than experience the cumulative effects of self-neglect. Regardless of whether an injury is being addressed – or if one is simply receiving a maintenance session for overall well being – clients often express feeling lighter and freer as a result of receiving a fascial unwinding session. Anything else you’d like to point out about the benefits of fascial unwinding? It is difficult to articulate the protocol of fascial unwinding through a mere description of the work. Hearing or reading testimonials of those who have benefitted from the work tend to have more dramatic impact, yet there is nothing that can replace one’s own experience of the work and the benefits realized for oneself. Are there any precautions about fascial unwinding that I should keep in mind? Fascial unwinding is generally not advised for those dealing with acute injuries. In the most conservative approach, it is best for clients to receive work when they are cleared for receiving manual therapy. If you feel that fascial unwinding could help set you free of particular body pains, consider finding a holistic health practitioner in your area who specializes in this treatment. Share this article with friends and family who may also benefit from the unique aspects of this healing technique, as well.